That Chiefs/Titans wildcard game was basically the entire essence of the 2017 Kansas City Chiefs in one single game. The 2017 Chiefs made the grandest opening statement you could make. Going into Foxboro, for a season opener, primetime, against the best team of the past two decades coming off one of the greatest SB comebacks ever, and beating the snot out of them in front of a stunned crowd. That’s how you start a season. That’s also going to be the only thing we remember the 2017 Chiefs for, honestly. They won 5 games in a row, against a very respectable slate of teams. They beat the Eagles. They beat the Chargers, which at the time looked like a joke but proved themselves more worthy as things went on. They beat the Skins, who weren’t quite so injured at that point. They beat the Deshaun Watson Texans, the only good Texans. They kept it close with an excellent Pittsburgh team, then struggled against a rival Raiders team, beat the Broncos, and that’s when things got bad. After getting shellacked by a mediocre Cowboys team and embarrassed by the dumpster fire that was the 2017 Giants, everyone kinda wrote them off. The team that started 5-0 ended up at 6-6. They rode a 4 game streak into the playoffs but it was too late. None of those games came against substantial competition with only the Chargers game meaning anything. We all gave up on the Chiefs. Once they lost to Ben McAdoo I stopped giving the Chiefs any thought whatsoever, because seriously, they lost to Ben McAdoo. Ben McAdoo. That may very well go down as the last game Ben McAdoo ever wins as a professional NFL head coach. And we should have, because that was a sorry showing. Yes, the refereeing was terrible. Yes, they lost Travis Kelce to injury halfway through, severely hurting the offense. But these excuses only work so far. They still gave up a 21-3 lead to another AFC team a lot of people probably wrote off even sooner and many likely forgot was even in the playoffs. They started strong, they fell apart. At one point Marcus Mariota threw a touchdown to himself. The Chiefs cannot protect a lead. I think this would be a bigger deal if we didn’t see almost this very same scenario just a few years ago. RIP, 2017 Chiefs. For a few games this year, you were very good. Now we get to see where Alex Smith ends up. I like the way you captured the pre-concussion intelligence of # 87. At this point I’m kinda impressed with how the Cheifs can keep on choking in the playoffs from year in and out. Excellent work with the hovertext. The best part was probably the numerous voice cracks by the announcer, especially during the fumble recovery that was called back at the end. I died laughing for a million years. BTW, to any Chiefs fans and/or KC media: this is who Andy is. He’s been an NFL head coach for almost 20 years now. He’s not going to “do better next time”, or “learn from his mistakes”. He’s a great play-designer who is a bad in-game play-caller and worse at adjustments and clock mgmt. Trust me, we waited for 14 years in Philly for him to grow beyond that. I’m sorry. Just hope that Pat Mahomes is good enough to cover for Andy’s shortcomings, the way McNabb was early in his career. So true. Reid is an extremely good “Monday to Saturday” coach, possibly even top 5, but his teams light win percentage on fire due to painful playcalling & mismanagement of time/TOs. He will have a job in the NFL for as long as he wants though, which prob means many more years of one & dones in the playoffs. >>> Now we get to see where Alex Smith ends up. 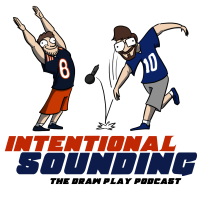 I’m just excited that Kareem Hunt is officially immortalized in a Draw Play comic. Yeah. He probably feels better after Andy Reid forgot he existed in the second half of that game. Marcus Mariota throws touchdown passes. Man, you got it right twice here. 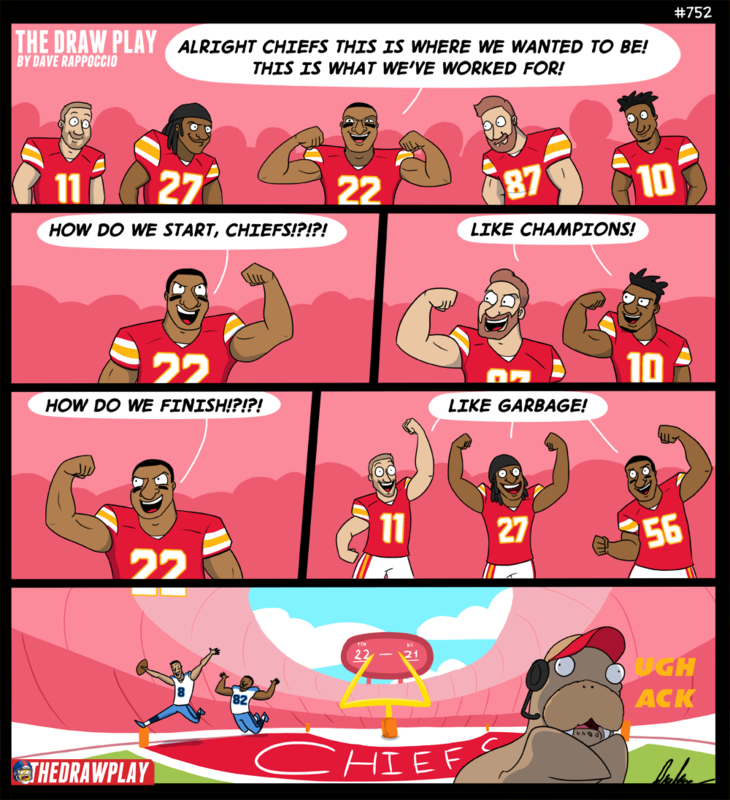 This comic is a lot like that Chiefs epic second half collapse. I saw it coming at Halftime. It seems like Mariota will become the next Jerry Rice or whatshisface who played for the Packers in the 1930s. Remember why Reid would wait until the conference title games to choke? That Was fun. I maintain my firm conviction that the only thing more inflated than Andy Reid’s waistline is his reputation as a coach. He’s fine as an OC, but he lacks the time management, game management, and situational-humility to be great. I was glad to see him come to the AFC West.